in dark opalescent dark silver with a beautiful, original red interior. 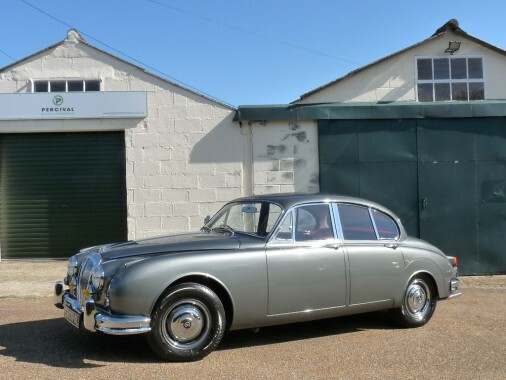 This fine Daimler 2 and a half litre V8 has covered only 30,000 miles since new and has lived in the area all its life. It was supplied by Martin Walter of Folkestone in 1965 and the stamped service book shows 14,445 miles in June 1970. One family owned the car from March 1967 until 2016 when it passed to a local enthusiast who carefully re-commissioned the car including a full respray simply because the paintwork had faded. No bodywork repairs were required. The bumpers were re-chromed and new fixtures used where necessary. The interior is gorgeous with lightly creased leather, lovely woodwork and the original carpets. A mark on the top of the rear seat is the only thing that detracts. Power steering is fitted, the original system from the factory, and with a smooth gearbox and the lovely V8 burble from the engine, the Daimler is a lovely thing to pilot. There are none of the normal crashes and bangs from the underside often associated with these cars and the drivetrain is free of clonks. The Daimler has never been welded and all the factory seams are perfect. The original tools and Dealer pack with handbooks are present.